It's often much more fun to select a window treatment than it is to install the appropriate rod for it. While choosing is entertaining, installation just looms as a chore. It doesn't have to be that way if you first master the art of curtain rod installation. An attractively mounted curtain rod adds a subtle layer of embellishment to an entire room. Beyond completing a room’s decor, however, a curtain rod possesses yet another secret power: the ability to disguise design defects. If your ceilings are too low, hang your rods higher. Wish your windows were wider? Extend the hardware well past the window on either side to fill the wall space with curtain. It’s all about the placement. 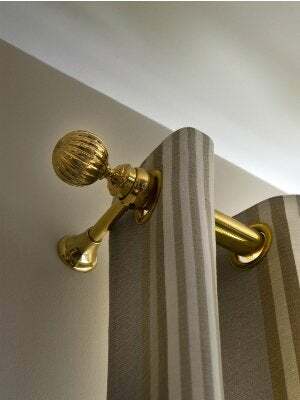 Figure out the best placement for your curtain rod and secure it with minimal fuss by following the easy instructions for rod installation outlined below. • A classic rod. This adjustable pole attaches to the wall with brackets and often features an ornamental finial at each end. It’s ideal for hanging curtains with pole pockets, grommets, and tab-top headings. 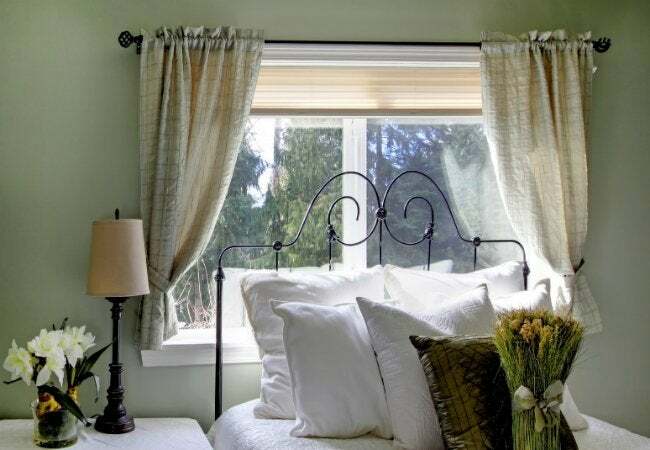 Opt for a double rod version if you’re interested in hanging inner sheers in addition to standard curtain panels. • A return rod. The U-shaped pole wraps around the entire window so that, when closed, the curtain completely blocks out incoming light. It’s also available in a double-rod version to accommodate a top treatment, such as a valance. Once you’ve chosen the rod you need, measure the width of your window to determine the correct size to buy. Decide whether you’d like to mount the rod to the wall above or directly on the trim, which would allow you to still see some decorative woodwork. A general rule of thumb: For wall-mounted rods, allow at least one to three inches on each side of the window to accommodate an open curtain, or as much as six inches on each side of the frame if you’re trying to make the window appear larger. Don’t forget to factor in additional wall space for decorative finials. Next, measure the window height. Wall-mounted rods are usually installed four inches above the window. To find your ideal placement, measure down from the ceiling to the top of the trim at the left corner of your window; mark the midway point. Repeat this in the middle of your window frame and in the right corner, then check your markings with a level. To give the illusion of height in the room, mount the rod even closer to the ceiling. Don’t go higher than eight inches above the window frame; any more than that looks awkward. While measuring, keep in mind the length of your curtain panels. If you can avoid it, you don’t want to have to alter the hems once you’ve mounted the rod. You may need to adjust your penciled-in placement by an inch or two to get the panels to fall where you want them. Curtains that just graze the floor or sill appear classic and tailored, while those that break slightly at the floor (from one to three inches) are also on trend. If you plan to puddle your curtains for a look that is extremely formal, allow six to eight extra inches of fabric to fall at the bottom. Skip this style if you plan to open and close your curtains regularly, as the bottoms will dirty quickly from constantly brushing the floors. Once you’ve factored in curtain length, window height, and width, hold a bracket up to the wall so that the position of the rod lines up with your initial markings, then use a pencil to indicate where the screws should go. Predrill the pilot holes at those marks. Insert the plastic wall anchors, align the bracket with the anchors, insert the screws, and tighten until the bracket is flush with the wall. Repeat the process for the other bracket. If your pole is longer than four feet, consider adding a center support to prevent sagging. Last but not least, attach the curtains to your rod according to the heading style by slipping the rod through the pole pocket, grommet rings, or fabric tabs, and capping the ends with finials if you so choose. Then, rest the pole in the brackets you’ve mounted, and step back to admire a job well done.